Article by Tim Carey ©. 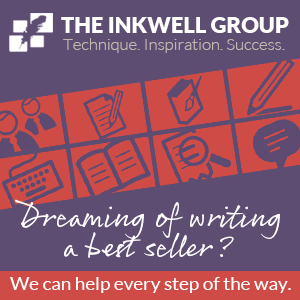 Posted in Resources (Essential Guides). 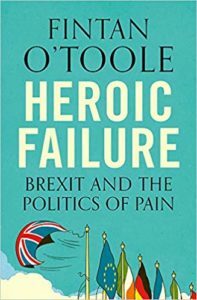 In Heroic Failure: Brexit and the Politics of Pain, the Irish Times columnist, journalist and doyenne of the Irish Times Fintan O’Toole, turns his forensic eye to what is not only the most pressing problem of our day, but also perhaps the most defining issue not just for the English (not British he argues, you’ll have to read it) history, but also Irish history; depending on how things turn out Brexit could be the most fundamental wrench to the Irish economy, society and psyche since the Anglo-Irish Treaty. 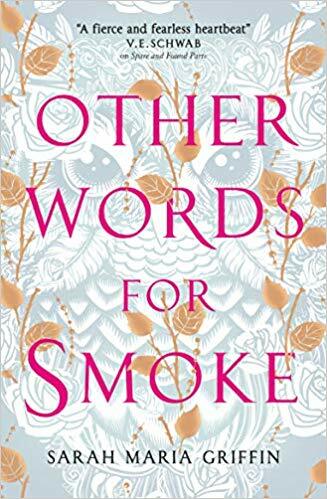 O’Toole’s book is a remarkable attempt to identify the deep undercurrents of the English mind – starting with their gradual but inexorable loss of status in the world since World War II as they walk towards Brexit. Get it before you become so tired of the whole bloody thing, or so upset at its consequences, that you won’t bother. In a time of international uncertainty there is a dare I say an almost nostalgia for the Cold War when the enemies were more clearly defined, and it was people, rather than computers, that decided the fate of nations. During these years’ spies played to certain rules and lived shadowy, duplicitous lives that lasted years, decades. 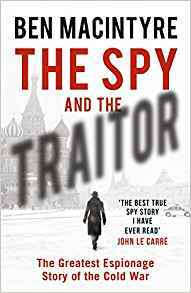 Ben Macintyre’s The Spy and the Traitor: the Greatest Espionage Story of the Cold War tells the remarkable trues story of one of the most important of the Soviet spies, Oleg Gordievsky, who turned British agent. For three decades he was probably the most important western spy and supplied Britain with key secrets of the USSR. In this case truth is must stranger, and more compelling, than fiction. David McCullagh, best known for his anchor role in RTE’s Prime Time, is also an accomplished historian who has just published the second volume of his De Valera biography: De Valera Rule 1932-1975. 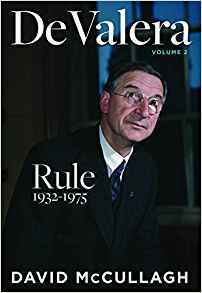 Always readable it provides the most comprehensive and balanced portrayal of de Valera. And that is no mean feat when dealing with one of the most controversial and contentious figures in Irish history, who has been lauded and condemned, sanctified and vilified in almost equal measure. McCullagh brings a rigour to his work that is unparalleled. It may not be one for those with a casual interest in Irish history but is pretty much essential for those with anything more. 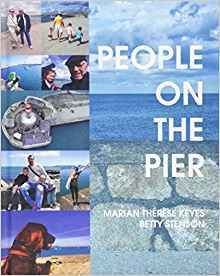 People on the Pier by Marian Therese Keyes and Betty Stenson started as a Dun Laoghaire-Rathdown Libraries project to mark the bicentenary of the construction of Dun Laoghaire Harbour. Still one of the world’s largest harbours the walk on the East Pier has become an essential component of life in that part of Dublin that is confirmed and reconfirmed by repeated visits. It features as the place of epiphany for Samuel Beckett in ‘Krapp’s Last Tape’, it has greeted Prime Minister’s and republicans, said good bye to countless emigrants, welcomed kings and gun runners. But in People on the Pier there are lovely intimate insights from those for whom the pier is not a place to walk, but an extension of their mental front gardens. A lovely production. Dublin: the Chaos Years by Neil Cotter is a book that will bring succor to those who await the day that the golden era of the men’s Dublin gealic football comes to an end and a warning to those who hope that is last forever. 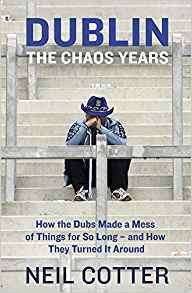 Subtitled ‘How the Dubs Made a Mess of Things For So Long – And How They Turned It Around’ it covers, for the Dublin supporter the awfully sad, completely desperate, often heartbreaking frequently frustrating period of Dublin football that ended with that epic victory against Kerryin 2011. Based on interviews with those who were involved it shows how it all went wrong, so frequently, and also shows how it easily could all go wrong again. 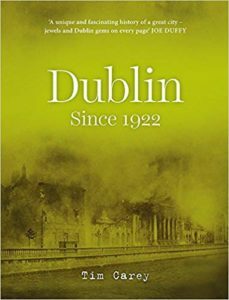 Dublin Since 1922 tells the story of Ireland’s capital city since independence. 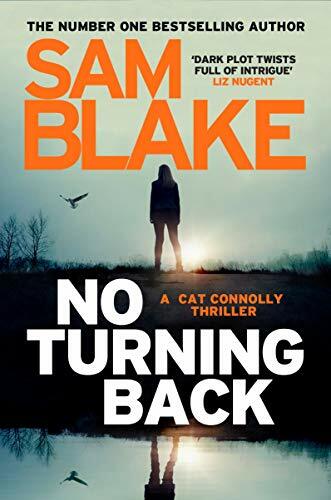 Richly illustrated throughout, it unfolds around hundreds of dates in the city’s history, beginning with the founding of the Irish state – when Dublin had the worst slums in Europe – and ending in the last days of the Celtic Tiger. Through major events, Carey charts nearly a century of the capital’s history, from the Civil War, the Eucharistic Congress and President Kennedy’s visit, to the 1986 earthquake, the Stardust disaster and the changing faces of the St Patrick’s Day parade. Brought to life are the figures who have shaped the city’s identity – from Archbishop McQuaid to Tony Gregory, from Luke Kelly to Maeve Binchy – and the daily life of its people, through the books they read, the way they move around the city, the music they listen to, the crimes they commit and the unique experiences they have of simply being in the city of Dublin. A captivating celebration of people and place, this book makes essential reading for anyone who wants to understand how the character of a city – and its inhabitants – is shaped. Tim’s history books include Mountjoy: the Story of a Prison, Hanged for Ireland, Hanged for Murder: Irish State Executions, Croke Park: A History and his latest and most ambitious book to date Dublin Since 1922. They are known for their engaging but professional style with each shedding considerable new light on key subjects in Irish history. Tim was born in Milwaukee, Wisconsin, USA and settled in Ireland after a bit of to-ing and fro-ing at the age of 12. Despite, or perhaps because of his American background, Tim became interested in Irish history and the history of Dublin in particular. He studied History and Geography in Trinity College Dublin before completing a Masters of Development Studies in UCD. Since graduating he has worked in the field of history and heritage. He managed many of Dublin’s state owned heritage sites including Kilmainham Gaol, he was Administrator of the GAA Museum and is currently Heritage Officer for Dún Laoghaire-Rathdown County Council. 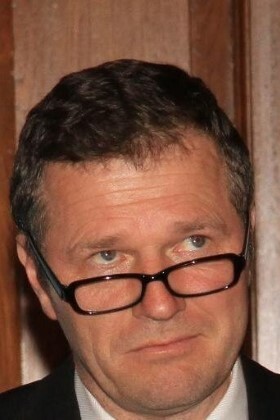 Carey was historical researcher for the highly acclaimed and popular series Ceart agus Coir about the lives and cases of the 29 people executed for murder in Ireland between 1923 and 1954 and the researcher for The Forgotten Ten about the ten republicans, including Kevin Barry, who were executed by the British during the War of Independence and later disinterred from Mountjoy Prison and given state funerals. Tim regularly appears on television documentaries relating to Irish history and has been interviewed for Irish and international media on various subjects. 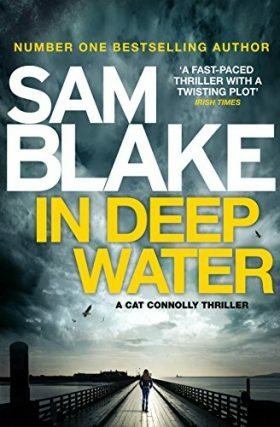 He is also a regular contributor to RTE Radio 1’s hugely popular Sunday Miscellany programme and has had pieces broadcast on a wide range of subjects from getting up early to play golf to the fall of the Berlin Wall.